The spring has kept us waiting. When I look out of my window I can still see a huge mound of snow just outside my garden. The chill in the air is perhaps a breath of Sila, the arctic weather god of the Inuit. Sila has given his name to a distant little body, previously known as 1997 CS29. It is the latest of the transneptunian objects that has acquired a proper name, and this happened in January, 2012. The name in its entirety is Sila-Nunam. The current Full Moon is in Scorpio. The Moon, and the Sun opposite it in Taurus, is squared by Sila-Nunam in mid-Leo. Since the Taurus New Moon two weeks ago, Sila-Nunam has stationed direct and is now in forward motion. This gives me a good opportunity to tell you a bit about this little transneptunian, about the mythology behind the name, and about the recent events related to it. Sila-Nunam is a classical Kuiper belt object, also called a cubewano, in a subclass of so-called cold population objects. The majority of the cold population objects have relatively round orbits and low inclinations like the classical planets, as has also Sila-Nunam. Its orbital period is little over 291 years. Sila-Nunam is a binary system, a double cubewano, consisting of two bodies tightly bound and with nearly equal sizes. It is quite common that the transneptunians have companions, and some systems even have more than two components, like the Pluto-Charon system. In a binary system the two objects are orbiting each other around a point in the free space between them. This point is called a barycenter, and it is a point where the bodies, which usually have a similar mass, balance each other. Classical transneptunian objects are given mythological names associated with creation. Sila is the Inuit god of the sky, weather, and life force. Though identified as male, he is formless and not thought to have many personality characteristics, and thus he is seldom depicted. Nunam is the Earth goddess, Sila’s wife. Nunam created the land animals and, in some traditions, the Inuit people. Sila breathed life into the Inuit. Sila-Nunam is the second transneptunian body named after Inuit deities, the first being Sedna. Sedna is the Inuit goddess of the sea and marine animals. In the Full Moon chart Jupiter is in conjunction with Sedna. This aspect emphasizes the arctic theme, because Jupiter tends to magnify everything it touches. Sila is one of the oldest Inuit deities, even older than Sedna. According to anthropologists, the belief is extremely old. The dominant religious system of the Inuit today is Christianity, but many Inuit still hold to at least to some extent of their traditional religious beliefs. So, at least a few people have believed in Sila, without interruption, from the distant past up to the present time. This is beautifully in accordance with astronomical facts. The cold classical transneptunians are thought to have formed very far from the Sun, in the outermost part of the protoplanetary disk. Having formed and remained so far from the Sun, they are thought to preserve solids from that environment in a relatively unaltered state. And in Eskimo language, the word Sila has meanings of universe, outer world, and space. Currently Sila-Nunam is undergoing a pretty rare season of mutual events, in which the two bodies alternate in passing in front of one another as seen from Earth. The season stretches from October 2011 to May 2013. These mutual events only occur twice each Sila-Nunam’s almost 300 year-long orbit around the Sun. Sila and Nunam orbit around each other every 12.5 days. They are very close in size, so by turns one of the two objects is hidden from view by the other during these occultation and eclipse type events as seen from Earth. The Taurus Sun squared Sila-Nunam on May 2, 2012. Squares create tension, and tension usually leads to action. Perfectly synchronous with the square, the news concerning the Arctic region caught my eye. Greenpeace activists tried to prevent the Finnish icebreaker Nordica from departing for the Alaskan Arctic. Sadly, Finland is involved in oil drilling in the Arctic. The icebreaker Nordica and its sister ship Fennica are owned by a Finnish state-owned firm Arctia Shipping. The oil company Shell is planning to open up the Arctic for oil drilling. Shell has leased both vessels for keeping the icepack from threatening their drilling platforms on the north coast of Alaska. Fennica already departed for Alaska in March. Last Tuesday (May 1) the Greenpeace activists boarded and occupied the icebreaker Nordica in Helsinki harbor. Police removed them after several hours of negotiations. Two days later (May 3) the activists boarded the ship again at open sea. They were removed again, this time by the Swedish police. The Arctic region is a unique area among Earth’s ecosystems. It is one of the last continuous wilderness areas in the world, and so far it has remained comparatively clean. The Arctic also holds 1/5 of the Earth’s water supply. Endangering this pristine area and putting profit before the environment is a disgrace. Arctic oil drilling is dangerous, because in freezing conditions oil is known to behave very differently than in lower latitudes. An oil spill would have a catastrophic impact. There is no way to clean up oil underneath the thick ice. Finland is one of the Arctic nations and we should be protecting the Arctic, not helping to destroy the vulnerable nature of it. As a Finn I am ashamed of our involvement in oil drilling in Alaska. 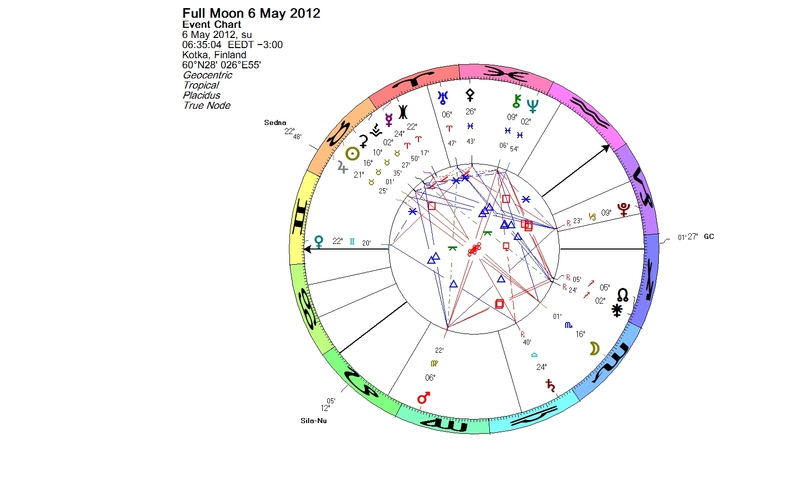 This entry was posted on Saturday, May 5th, 2012 at 9:53 pm	and is filed under Full Moon. You can follow any responses to this entry through the RSS 2.0 feed. You can leave a response, or trackback from your own site.